Intermedia Brand Marketing was founded in 2010 and specialises in magazine marketing and distribution, including retail newsstand distribution and subscription marketing and fulfilment. The business has achieved very strong growth since launch, but in the last two years, subscription marketing and fulfilment is where much of the growth has come from. This has led to the expansion of its warehousing and logistical operation which houses growing stock levels of magazines and subscriber gift items which are then picked and packed to customers through its mailing service, both domestic and international. As this activity grew and more publisher clients were brought on board, a separate division of the company, Intermedia Solutions, was created to handle it. Intermedia Solutions now operates as a wholly owned subsidiary of Intermedia Brand Marketing Ltd.
Intermedia Solutions was initially outsourced to a third party logistics provider. However, after some time the company felt it could offer greater flexibility and more competitively priced solutions by bringing the activities in-house. As a result, Intermedia Solutions moved into its current storage facilities in East Grinstead in 2016. Since then, thanks to flexible arrangements with its landlord, it now occupies eight times its original space, and its staff numbers have quadrupled. 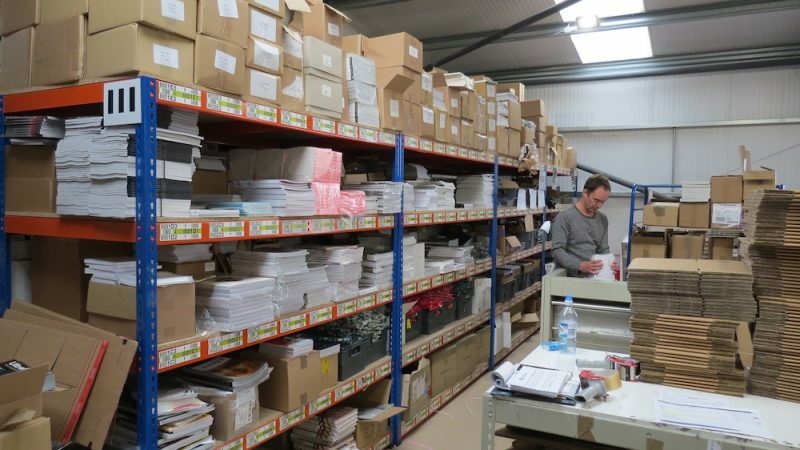 At the outset, Intermedia operated its stock control using sophisticated spreadsheets to record stock and despatch activity, but with a clear objective to implement fully fledged warehouse management technology to support the ongoing growth and operational efficiency of the business. The chosen technology needed to control stock accurately by location, produce picking and despatch paperwork and maintain a full history of orders and stock movements. It also needed to integrate with Myriad, specialist subscription management software for the publishing industry which in turn, needed to link directly with the WMS. Once the ProSKU decision was made, some internal work was needed at Intermedia before they could go live. Dave acknowledges that, “there were a few things to sort out,” in terms of defining their processes and creating their own location coding system. The Myriad order integration proved straightforward however, being completed in a few days using the standard ProSKU API features. But in the event, thanks to their preparation, Intermedia needed very little training and almost no handholding at go-live, other than occasional reference to the ProSKU helpdesk. Previously if picking errors were made they generally became aware of them because of client complaints. Now, because of the two-phase pick and sort process there is a secondary check element. As Dave McGrory explains, “we have brought recognition of errors forward and can do something about it before we despatch the orders.” He cites this as one example of how they have matched their processes to suit the system, and as a result, those processes have been improved. The original remit of the Solutions division was to support the main brand marketing activity, but also to develop as an independent service provider. So in addition to the client mailing service it now offers a range of services in both B2C and B2B areas. These include support for retail operations involving shipment of publishers’ titles to smaller retail operations; management of e-commerce shops for publishers, involving pick and despatch of gifts and toys; and wholesale orders, where large volumes of titles are shipped to wholesalers for onward supply. In short they now aim to offer everything that a publisher could want as a service. This successful growth relates to a number of factors. Their connections with the publishing world have created spin-off business and led to a growth in solutions they can offer. This has been assisted by the departure of one or two competitors, with the result that business that had grown steadily over three years has accelerated in the last year. Where they once used a single courier they now have a total of six, as well as a pallet network operator and an international consolidator. In conclusion, Dave McGrory is very happy with ProSKU and the benefits it provides to them. As well as the product features, he is also delighted with the flexible approach shown by ProSKU in relation to a number of non-standard requests, especially on the reporting side. So all good so far! The system is helping them manage current workloads in ways that wouldn’t be possible without it, and they expect that to continue in the future, whichever way their developing business takes them. February 21st, 2019 | Comments Off on Can web orders be imported into a WMS for integrated stock management? November 21st, 2018 | Comments Off on Are you asking the wrong question about WMS?